Warning: This post is full graphic images that might cause you to drool or have cravings in odd hours of the day. When it comes to eat-all-you-can restaurants in Cebu, it is hard to beat the quality, variety, and value that Tokyo Table offers. I have eaten at this buffet restaurant several times and each time, I always discover a new favorite dish. Tokyo Table never ceases to amaze me. This is one of the restaurants that I can truly say to my friends and #kalaminions as a must-try. Tokyo Table is located at the ground floor of City Times Square Mandaue. When you enter the place, you will immediately be greeted with shouts of "Irasshaimase" which is Japanese for "Welcome!". You will definitely feel some kind of excitement upon hearing such energetic greeting while seeing a very sleek restaurant. It is clean, cold, and it smells like a hotel lobby instead of the usual smoky or greasy aroma like in some other restaurants. I usually start with a plate of some fine Japanese dishes. I love how innovative they are with their makis and sushis. They have some traditional items like Salmon Roll and the restaurant also offer some fusion makis like sisig roll, Philadelphia roll, and peach summer roll. Their Signature Roll is pretty awesome as well. I also add some slices of their sashimi on my first plate. If you just want to feast on Japanese dishes, Tokyo Table has a solid line-up to cure your craving for dishes from Japan. Beside the sashimi boat, is their shrimp cocktail. According to their operations manager, this is one of the dishes that you should not miss. I tried and I could probably just spend my whole dinner feasting on shrimps. The shrimps are cooked perfectly and it seasoned really well. Even without sauce, it is something that shrimp lovers will rave about. The sauce gives it more acidity which turns their shrimp cocktail into one mouth-watering treat. You cannot call yourself a Japanese Restaurant if you do not serve tempura. Their ebi tempura comes in a very good size. I have seen other restaurants who claim to have tempura and only to disappoint by giving its diners more of an ebi fry. At Tokyo Table, it is really tempura cooked properly. It has a crunchy batter which is not too heavy. The size is more than decent. As a bonus, the restaurant refills quickly. Here, you do not usually wait in line to wait for another batch of tempura to be cooked. Some people would like to start their meals with some greens or soup. Tokyo Table has some options for salad as they have a mini-salad bar. They have several options for soup like miso soup in the Japanese area. For those who want something special, they can request for a shabu-shabu to be set-up on their grills. Another good option for soup lovers is Tokyo Table's ramen. You can either choose from pork or chicken. Their ramen has some ajitsuke tamago (boiled egg), menma (bamboo shoots), mushrooms, and meat. Their broth is very mild and pleasant to sip. For an eat-all-you-can place, they really serve some authentic ramen or close to it. A bowl can cost over 300 pesos in some Ramen places in Cebu and the quality is very close to what Tokyo Table is offering. If you really love ramen you can have as many bowls as you want here plus you get free drinks, desserts, and side dishes. I probably just found one of the best places to go when I crave for some ramen. After getting some soup, I usually check out the dimsum offerings. The restaurant serves a solid amount of dimsum options. They have the favorites like siopao, siomai, and chicken feet. The dimsum choices are really good side dishes for the ramen. 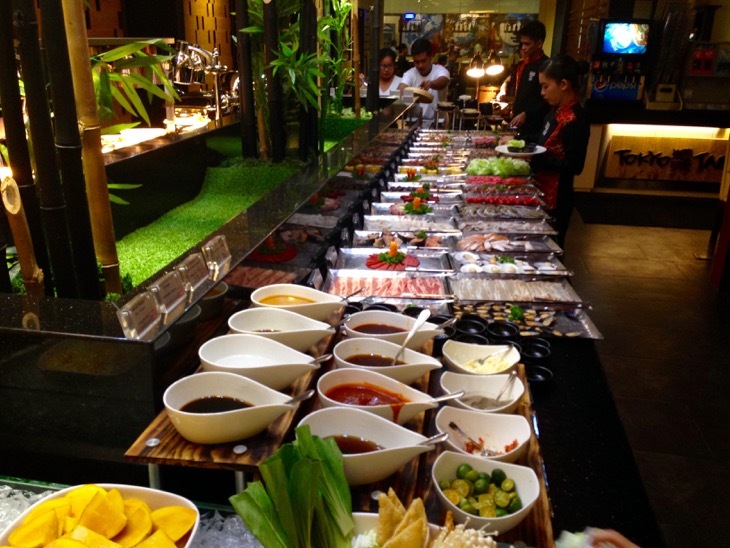 You cannot help but appreciate the variety of hot dishes available at the buffet restaurant. These are carefully selected dishes that has been favorites at the homes of the people behind the restaurant. The influences can from different parts of the world. On the latest night that I had dinner there, they had Mackerel Scotched Eggs, Singaporean-style Noodles, Adobong Dilaw, Mongolian Pork and many more. I also got to try Tokyo Table's Bibimbap which was made in front me. The Korean-inspired rice dish was really memorable. It tasted so good for a dish that did not have meat. It was crunchy, flavorful, and simply a joy to eat. You cannot have too much of the hot dishes because you need to save some space for more of their offerings. Tokyo Table prides itself as one of the best Yakiniku restaurants in Cebu. I actually first discovered this restaurant because of my love for yakiniku. I love grilling meat and having to cook your own food in a nice restaurant setting is a wonderful experience. It is also a good venue for my wife to "cook" for me since she rarely does it at home. There are more than 20 items to choose from. They have pork, beef, chicken, seafood, and corn. They also have several sauces available. There are also several side dishes that go so well with grilled meat like kimchi, atchara, and bean sprouts. The price you pay for the buffet includes unlimited servings fo drinks which include soda, iced tea, juices, coffee, and beer. If you want to splurge a bit, they are offering cocktail pitchers of carbonated drinks for a price. I tried the Watermelon Fizz and it was really different from your ordinary juice. They also have an alcoholic version called Think Pink Cocktail fizz. Having delicious desserts is the best way to cap a belly-busting buffet experience. At Tokyo Table, the options are abundant. Their selection can rival some of the best dessert shops and cafes in Cebu. The sweet tooth can definitely have what Instagrammers call a #foodgasm if they check the dessert "buffet". One of the best things about the desserts here is that the serving sizes are small enough to allow you taste several of their creations. I tried a few of them and they are really good. Their mango float and creme brulee are some of their must-try sweets. If I have friends from out of town who would ask me for a good buffet place in Cebu. Tokyo Table would be one of the restaurants that would be on top of my list. It is also on top of my list for Yakiniku, Japanese food, and desserts. If you have not eaten here, I strongly recommend that you try this restaurant in your next payday or special occasion. Tokyo Table is located City Times Square (Back of Parkmall), Mandaue City. How APEC turned me into a Food Blogger?? ?